Esther Brinckman travelled to Kurdistan on an ADRA Connections media trip. She shares on her stories from the trip here. We are invited into the tent that, for the time being, has become their home. They don’t have much more than the clothes on their back. Still, they offer each of us (our media team of three, plus translator) a cooled bottle of water, which is much appreciated since the sun burns hot and the temperature outside has risen to almost 40°C (104°F). We are visiting during Ramadan, so the family does not drink anything themselves until night falls. I don’t know how they can manage in this sweltering heat. Apart from inside the tent, which warms up considerably in the sun, there is no shade to be found in the camp. After our translator explains the purpose of our visit, Younis’ father tells us about their family. He and his wife have two adult sons, one daughter and six smaller boys. They used to live in a town in the Zummar district. When the fighting came to their home town they fled towards Mosul. At that time, apparently a safer place. Because they had left everything behind and had no money, they couldn’t afford to rent a house. So they stayed in a mosque. For nearly three years this was where they lived. They were told they could not stay in the mosque unless they joined ISIS. This they refused to do. Under threat of killing the family right there and then, they made them choose one of the three adult men of the family to come with them. Younis decided to sacrifice himself, because of the three he was the only one without a family of his own. And so he was taken by ISIS. For several days, he was used as a human shield by them and finally left behind as a decoy while ISIS retreated from the heavy fighting. Mortars firing injured him badly. Relatives saw him lay in the street wounded and took him to the hospital, which was still under control of ISIS. They refused to allow him medical treatment because he had not joined them. The result of this was that both of his legs were lost and had to be amputated. Somehow Younis and his family managed to escape Mosul just a few weeks ago. I cannot imagine what life must be like for Younis right now. The horrors of the fighting that he has witnessed, the hopelessness of living in this camp just waiting for the warfare to end and the prospect of a difficult life as an handicapped person. All of these things must have an enormous impact on the mental well-being of a person. Younis has a quiet, sad look in his eyes. I wonder if he is able to sleep at night, how he passes time during the day and what his hopes for the future are, if any. We ask him about his hopes. He answers us that he would really like to finish school. He still has about one third of his school program to finish. This is the goal he has set his mind on. I am a little startled to hear this answer, and I admire his determination to obtain a normal life again. But in order to be able to make this happen he needs to have legs. Because in Iraq – even outside of conflict – there are few facilities for handicapped persons and going to school would be nearly impossible. This family no longer owns anything and certainly have no money to get their son prosthetics. They are completely dependent on the benevolence of others. We leave the family with a burden in our heart. 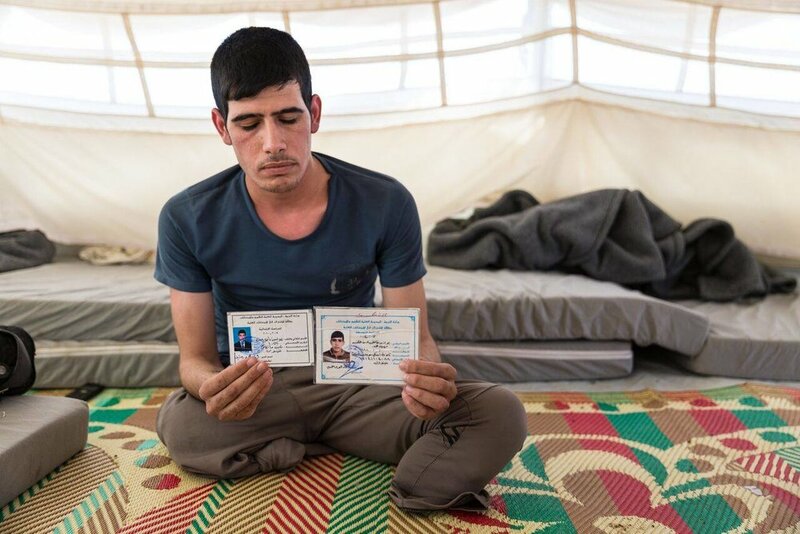 If only we could help Younis get his life back, to give him the hope of a better future. We have made this family no promises, but we’ve decided we will try to find a way. If it was in your power to give Younis back a future, wouldn’t you?